​William Daw was born in Frampton during the spring of 1897 and baptised at St Mary's on 18 July the same year. His parents were William David Daw, a carpenter, and Maria née Warren; the family's home was Beehive Cottage, The Street. In 1911 Bill, or Will as he was also known, was a grocer's apprentice. There are few surviving records of Bill's service but according to the Gloucester Journal he enlisted at Gloucester on 18 June 1915, the same day as William Joseph Ernest Gleed. 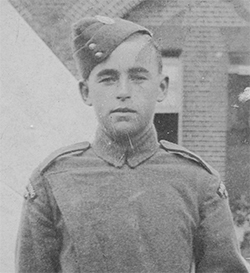 He was an air mechanic in the Royal Flying Corps and at some stage was posted to Egypt. Bill gained four chevrons for good service and is among those commemorated on the plaque in the village hall. Little has been traced about his life after the war, although family members recall an aircraft propeller being kept in his garage at Beehive Cottage. From 1918-21, Jacob Jonas Godwin was also registered at Beehive Cottage, probably as the Daw family's lodger, in the part now known as Falfield Cottage. In the summer of 1926 Bill married Florence Mary Brookes of West Malvern, and at some stage served as a special constable in Marlborough, Wiltshire. The death of William James George Daw was registered in the Hereford district in the spring of 1967.